To be fair, Hudgens’ costume on Saturday night at her party was gorgeous and over-the-top in the best way. We’re guessing that when you go all out for Halloweek, when actual Halloween rolls around on a Tuesday, it’s hard to muster up the energy again. Last night, Hudgens wore an “I’m a cat” hoodie, cat ears, and some shiny pleather pants. It’s simple, chic, and cute — the perfect lazy girl’s Halloween costume. 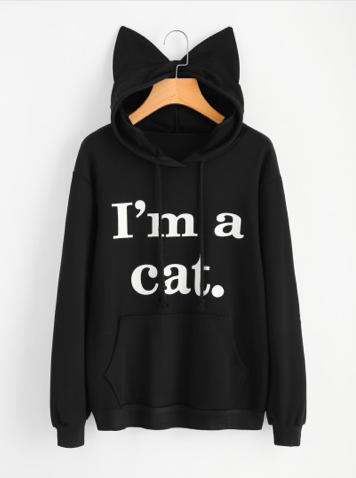 The hoodie is a play on the line from Mean Girls when Amanda Seyfried’s character walks out in lingerie and then points at her mouse ears and says, “I’m a mouse, duh.” The original “I’m a cat” hoodie is by the brand Wildfox, but you can easily find knock-offs all over the internet, like this one here. We must give credit where credit is due because Hudgens’ costume at her party on Saturday night was perfection. She and her boyfriend Austin Butler were gorgeous, whimsical, sad-clown-type things. Earlier this month, her The Craft-inspired look also slayed. Sadly, it is November 1 and we have to say goodbye to the Halloween queen. Until next year!